I'm still playing with my new little mini Janome sewing machine. I made another card a couple weeks ago. This time I tried the zig zag stitch. I tried to take a photo of it as close as I could. I used all Hero Arts stamps for this card. That lacy border punch is another Martha punch that I bought. 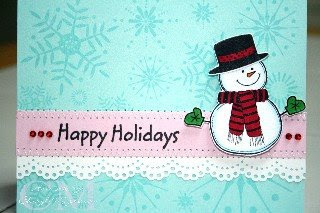 The snowman is cut out and mounted on the card to give a little dimension. I finally worked on our Christmas cards yesterday, and this year I went real simple. 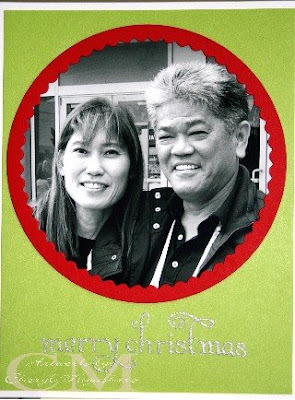 The only thing that took time was embossing the word Merry Christmas. So, now I am off to the post office to drop these in the mail. Thanks for stopping by today and hope you're all having a great holiday season!